Norbert 395 km SSE of the southern tip of Baja California. Norbert is moving toward the west-northwest near 13 km/h - 8 mph and this general motion should continue today with a turn toward the northwest expected on Thursday. On the forecast track the center of Norbert is expected to approach the southern tip of the Baja California peninsula on Thursday. Maximum sustained winds remain near 95 km/h - 60 mph with higher gusts. Strengthening is forecast during the next 48 hours and Norbert is expected to reach hurricane strength by Thursday. 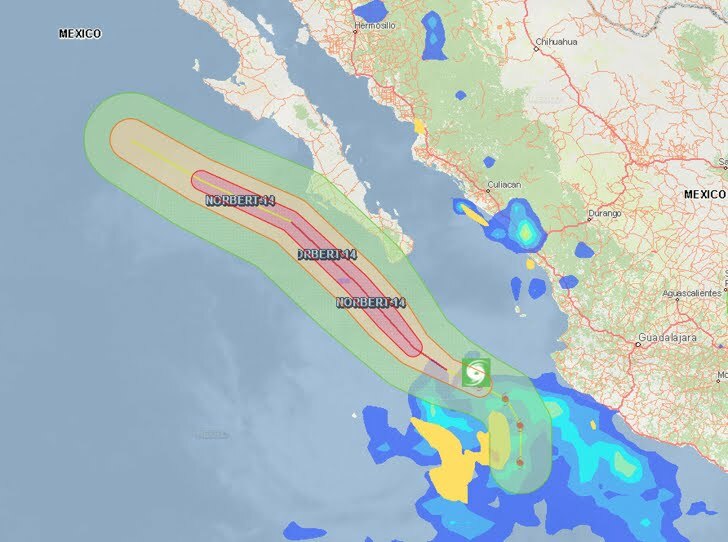 Large swells will affect portions of the southwestern coast of Mexico today and Thursday and produce dangerous surf conditions and rip currents. Large swells will gradually spread northward into the southern Gulf of California and affect the southern portions of Baja California Sur by Thursday.